65 people have viewed this property this week. Welcome to Lone Palm! Nestled in Gun Bay along the East End, Lone Palm is a 3-bedroom, 3-bathroom award-winning home designed by renowned architect John Doak. 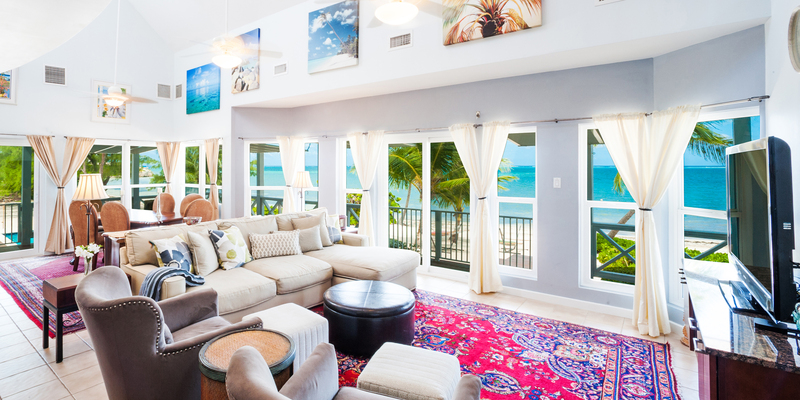 An open concept living area with vaulted ceilings opens up to a full-width beachfront veranda with a private pool, sundeck, and a white sandy beach with great snorkeling. Lone Palm sleeps 8 guests across two master suites on the main floor, plus a bedroom and loft with daybed on the second floor. 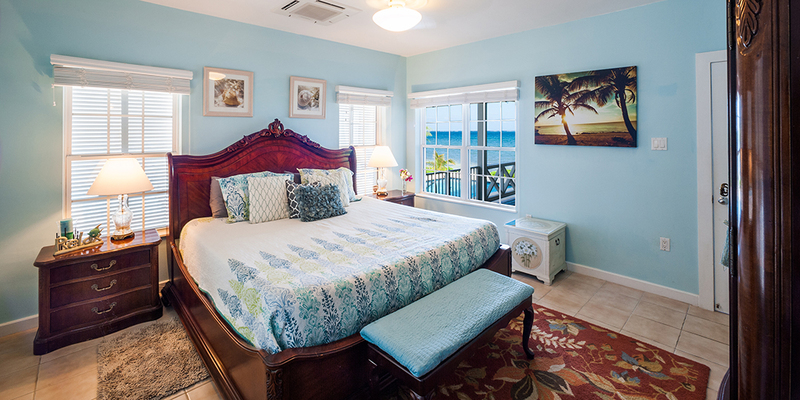 The oceanfront master suite with king-sized bed and en-suite bath includes sliding glass doors onto the covered veranda, plus a flat screen TV, and desk. The other master bedroom comes furnished with a king-sized bed, attached bathroom, and has views of the ocean and pool deck. 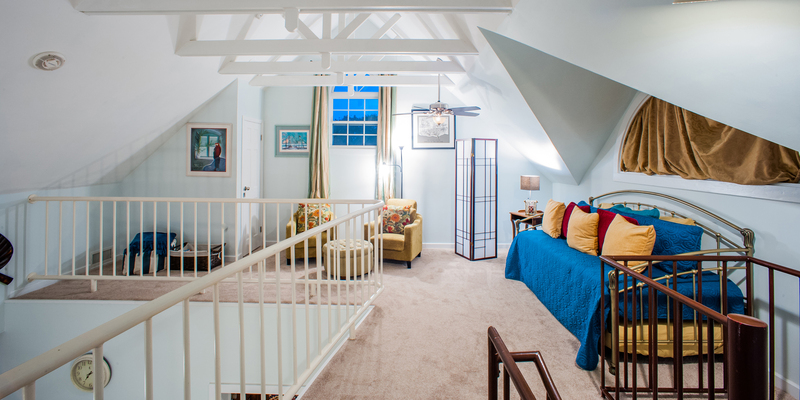 The upstairs bedroom comes with a queen-sized bed and private bath. 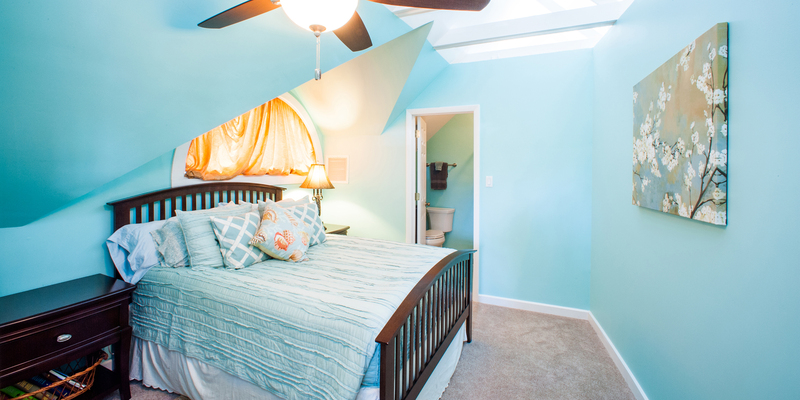 The loft area includes a sitting area with daybed and trundle underneath for additional guests. 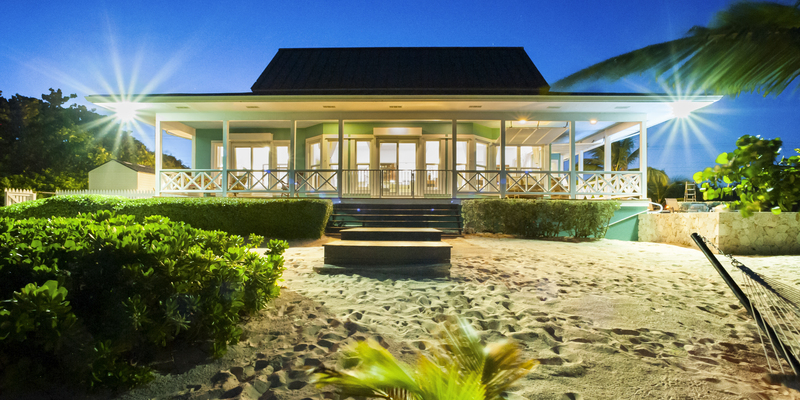 Location and convenience are key factors with guests who choose to stay at Lone Palm. 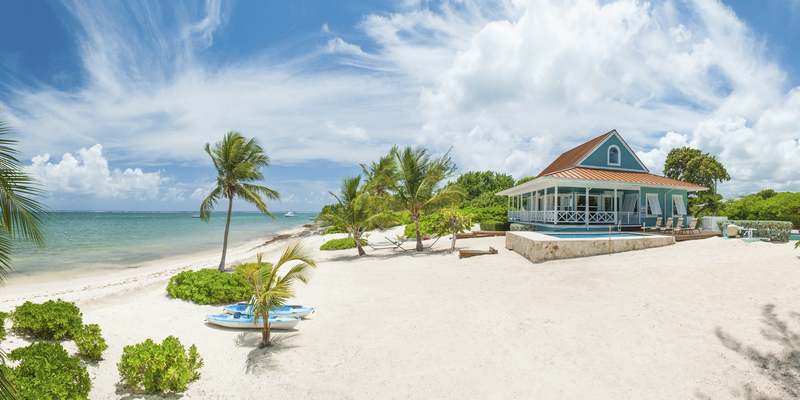 The home is within walking distance to Ocean Frontiers Dive Center, Eagle Ray’s Dive Bar & Restaurant, Bombay Chopsticks, Big Tree BBQ, Vivine’s Kitchen and a small shop at Compass Point. Lone Palm is also often used as an overflow villa for larger families renting the Cayman Castle next door. Renting those two properties puts 950 feet of private shoreline between the two homes with 3 pools, plenty of room to entertain while still maintaining privacy. 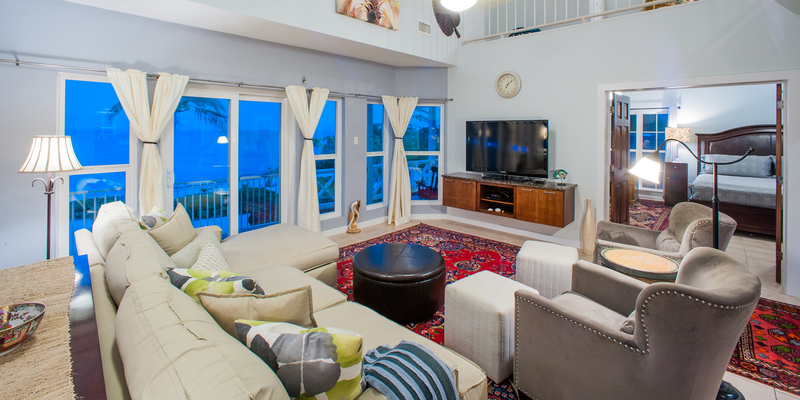 Oceanfront living and dining area are flooded with natural light, ocean views and access to the beachfront veranda. 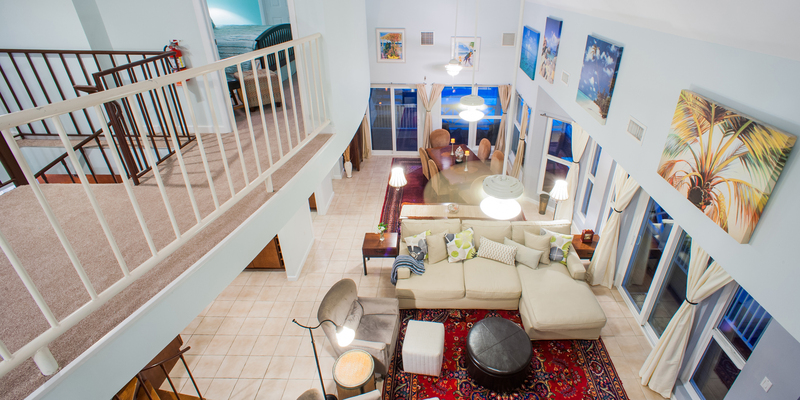 Living area has tons of comfortable lounge seating, a flat screen TV, and dining table for 6. Cookware, dishware, cutlery and a coffeemaker are all provided. Two kayaks for guest use. Located only 150 yards from Ocean Frontiers, voted the best diving operation in the Caribbean (2013), and within walking distance of 2 restaurants and 2 casual island-style lunch spots. Tukka restaurant is only a mile north and two large resorts with water sports, restaurants, grocery stores and bars are only a mile north of that! 300 feet of white sand beach to the north of the villa is also available for guest use (Castle kayaks and beach chairs are private, unless renting the Castle as well). 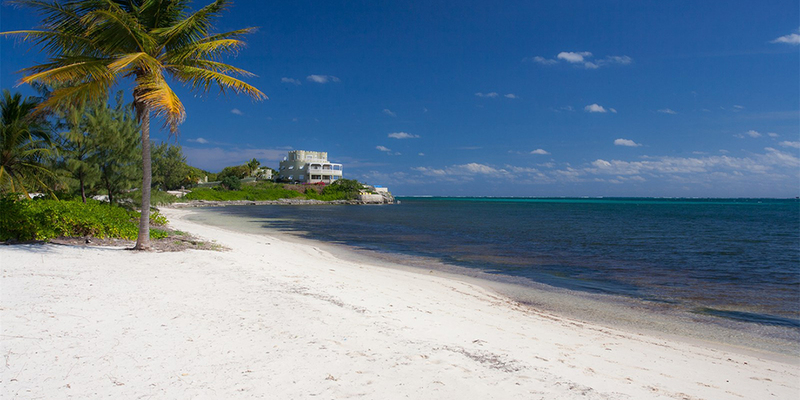 The beach and home are very private--it’s rare to see anyone during your stay. 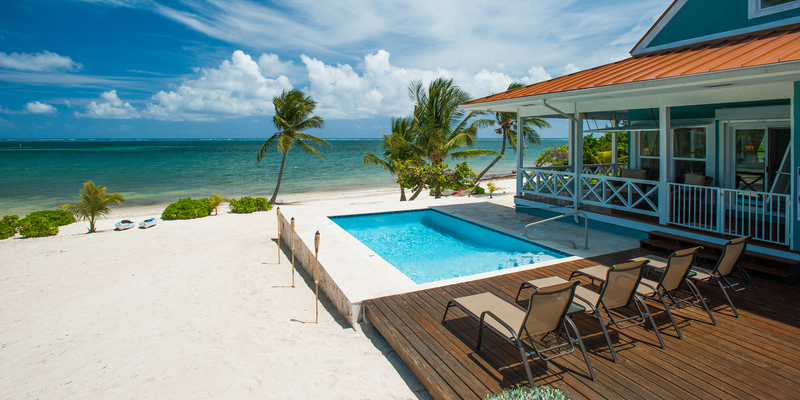 Perfect for honeymooners or couples looking to get away from it all! Lone Palm sits on an acre oceanfront lot in Gun Bay along the East End. 2-3 restaurants are within walking distance for lunch or dinner. Tukka Restaurant is about a mile north. Two miles further north are 2 large resorts (The Reef and Morritts) with manicured beaches, pools, restaurants, bars and watersports. The beach at Lone Palm is white sand and quite private. The water is more snorkeling than swimming here...it is a marine environment and we advise guests to wear pool shoes or fins to protect their feet. You can walk 100 yards to Ocean Frontiers, voted 2013 best dive shop in the Caribbean. The house was in excellent condition and we had absolutely everything we needed from cookware, beach toys, beach towels, tv, wifi and more. 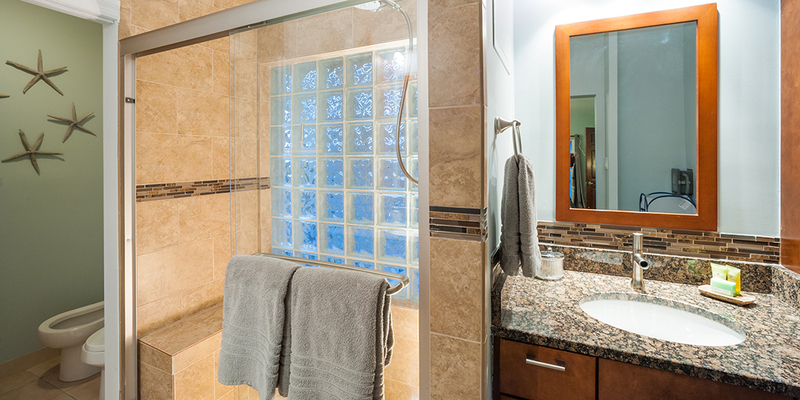 We could tell that the owners of this property truly want others to enjoy it as they do. The neighbors were also very friendly. 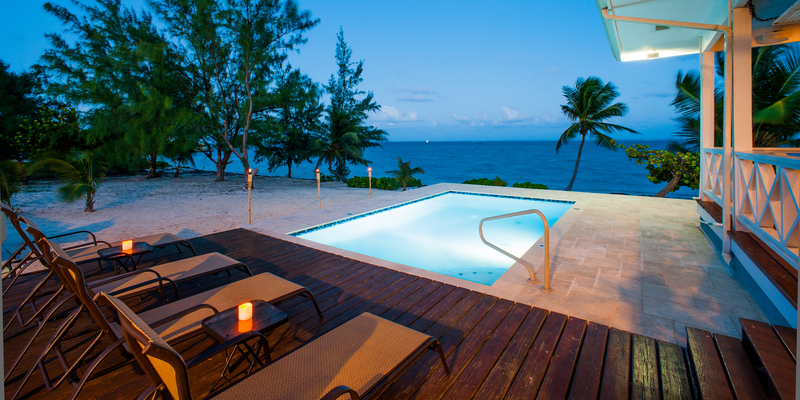 Our contact at Grand Cayman Villas was helpful from beginning to end. Scott helped us find the best property for our needs - we wanted a pool, beach access, within walking distance to a few restaurants and within a the busy holiday season. We received great recommendations for grocery shopping, driving around and charter tours. We did not contact our property manager as we had everything we needed. We enjoyed dinner at Taco Cantina and Tukka and a few lunches at Rum Point and Kaibo Marina. The north/east end of the island is quiet but has all of the amenities you need (grocery shopping, liquor stores, diving, charter boats). Our four children took the resort diving course at Ocean Frontier Dive Shop and the instructors were great. We only wish we had planned more dives. We also spent one afternoon at Rum Point and another at Kaibo Marina (renting jet skis and paddle boards). With less traffic in the area, my daughter and I were able to take long runs on the scenic road. This was our second stay at Lone Palm. It is a very clean and well stocked home. We enjoyed the kayaks and the ocean beach as well as the hammocks and pool. We were close to restaurants and grocery but the property still remains secluded and private. This rental is the perfect size for our family of 5. The views from the porch are amazing. 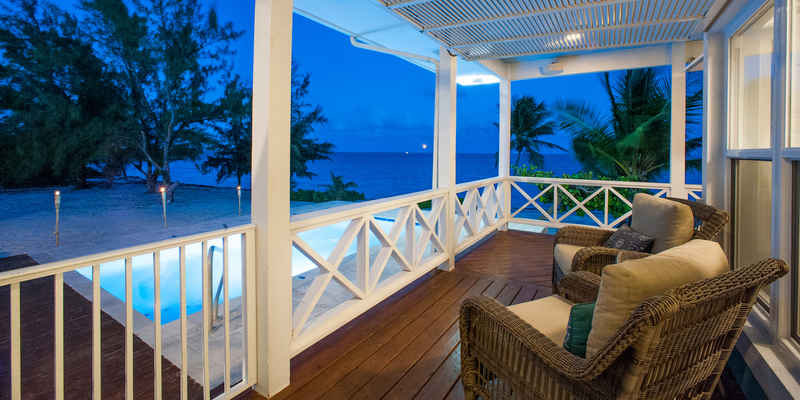 We highly recommend this home and the Grand Cayman Villas. Everyone was friendly and the booking, check in, and check out processes were effortless. This was our first time visiting Grand Cayman and it will not be our last. We love Lone Palm! Thank you for making this amazing home available to play and relax in. The full moon was spectacular over the ocean! The view here never gets old or tiring. It was truly amazing! We took a lot of great pictures... in the middle of January back in Minnesota we will look at them to warm our hearts and remember fondly our wonderful time spent here! Dan & I were here one year go & we stayed at the Wyndham Reef Resort. We will never stay anywhere else after staying here at Lone Palm! We fell in love with this place 🙂 Thanks for sharing your G.C. Haven. We kayaked , swam, grilled with friends and ate at some great places. Eagle Rays & Taco Cantina were a must. We also loved Alfrescos, South Coast B&G and Nadine makes great burgers across from Pirates Cove. Bring your passports to Hell- they will stamp them, you really should go just to see it. MUST use Ocean Frontiers for scuba diving and Silver Thatch Charters for snorkeling. Thank you for everything!! ... From the moment we stepped out of the car, we all knew we ha found paradise here at Lone Palm villa!! W had been looking at pictures on-line for months, but nothing compares to its in-person beauty. 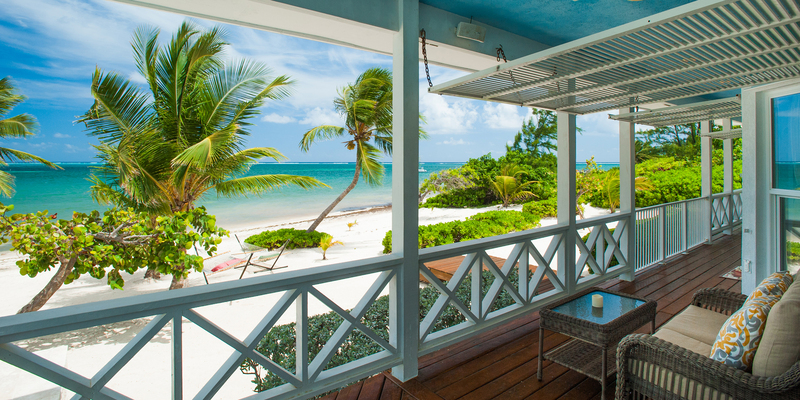 From the panoramic view on the porch, to the waterfront view from the private pool, to the breeze while laying on the double hammocks, this villa more than exceeded all of our expectations. 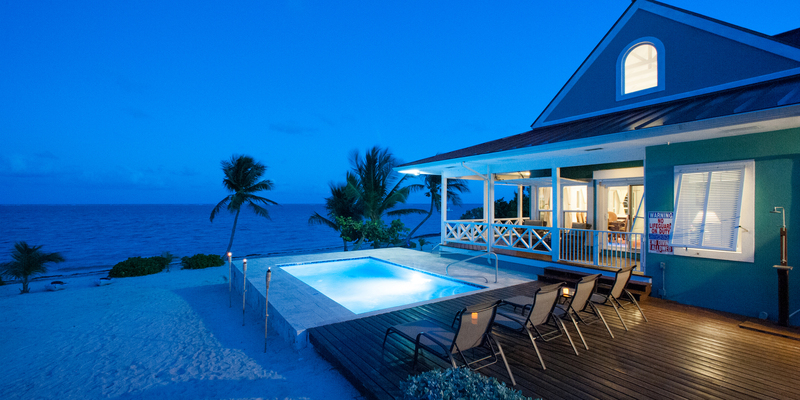 This beautiful villa was well equipped with all the amenities one could ever need. The kayaks and paddle boards were an added bonus to explore this villa\'s beautiful backyard. This was our first trip to Grand Cayman and it was a first for many things. it is always exciting and thrilling to go on a vacation to a new location and the island did not disappoint! We took our small group of 3 and rented a Jeep to explore our week-long home. The water is made of colors out of a painting - the blues and greens and waves where we snorkeled and swam were unreal. The best snorkeling was at Smith\'s Cove and an excursion with captain Marvin! Stingray City and Starfish point are MUST SEES! We at lovely meals at Tukka\'s, Coconut Joe\'s, Peppers, and lovely The Beach House. That\'s where this vacation has become more than a vacation- my sweet Dallas asked me to marry him and both me and my daughter said yes! We will forever hold Cayman in our hearts. Thank you for a gorgeous place to be together! This was our first visit to the Cayman Islands and we stayed at Lone Palm for the second portion of our week long trip. We really enjoyed your home and it couldn\'t have been better stocked! We spent our mornings going to Rum Point, Smith Cove beach, a charter that took us to Stingray City/Starfish Beach, and Seven Mile Beach. We spent the afternoons playing basketball in the pool, floating around, and lounging in the hammocks. In the evenings we had delicious home cooked meals, Tukkas, and Eagle Rays. One of the nights there was an awesome storm that we were able to watch from the porch. We also enjoyed our lizard and rooster/chicken friends on the island! The Lone Palm was the perfect spot for our group which included 4 adults and 4 children under the age of 6. The kids were able to stroll out to the sandy beach or pool without us having to worry! We went to the grocery store and stocked up on food and ate mostly at the house. The kitchen was a little small but very well equipped! We ate a few nights out at the closest spots which included Taco Cantina (so yummy), Tukka (the Tuna Tartare is to die for!) and Eagle Ray\'s. The only draw back is that the house is pretty far from 7 mile beach so expect about a 45 minute drive if you want to go check out that beach. 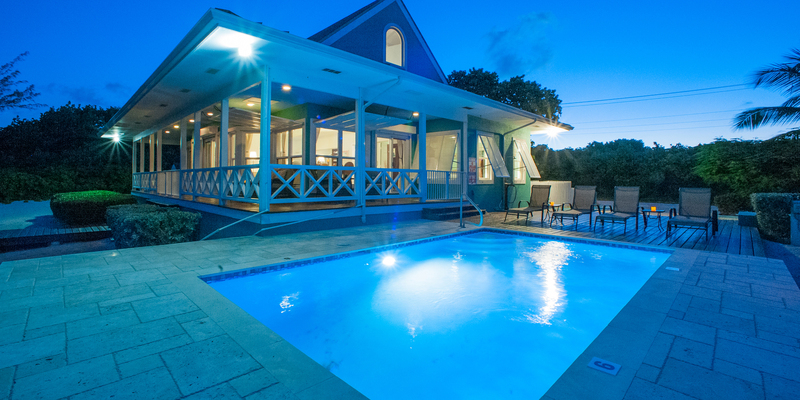 I have to brag on the property management company (Grand Cayman Villas & Condos). Our house had horrible sargassam weed while we were there and they were so proactive about letting us know and working on other options for us even though it was completely out of their control. I would book with them again in a heartbeat because they were so accommodating! Beautiful home, your own beach and pool, everything you could possibly need right there! We rarely left the property and only wanted to get back as soon as possible when we did. We\'ve traveled the Caribbean for 20 years and this was our most relaxing vacation. I still can\'t believe we had an entire beach to ourselves as most of the time on other vacations we spent on crowded beaches. Several good Caribbean restaurants close by, groceries/alcohol 5-10 minute drive. Rum Point not a bad drive either if you want to get out for some action, but once we saw the crowded beach we ended up going home fairly soon to our own paradise. When driving, pay attention to speed limits and they are in KPH, not MPH. Wish we were there right now! We thoroughly enjoyed our week here at your little slice of paradise! Exploring the East End and the North Side fo the island for the first time was lovely, and we were so pleased to have wonderful dining options within walking distance. The hammocks and porch were perfect relaxing spots at the end of the day. We eagerly look forward to another visit. First Trip to the Caribbean! This was our first trip to the Caribbean and Grand Cayman. We could not have picked a more beautiful location and home. We enjoyed our time on the porch every morning and evening. The pool and the hammocks were a treat. This is such a beautiful island paradise. We did get around the island while here. 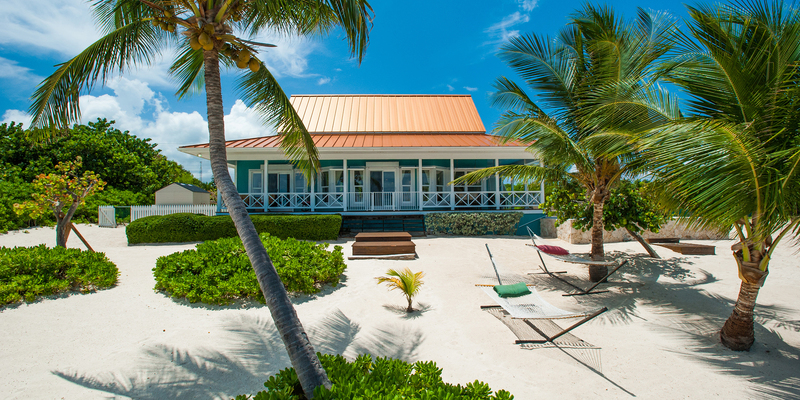 We eat at Eagle Rays, Tukka\'s (our favorite), and Rum Point. We visited Stingray City and snorkeled. We checked out 7 mile beach and Cayman Turtle Center (the kids loved it). Go in the morning, we had the place to ourselves. We went diving with Ocean Frontiers, a truly wonderful experience under water. The reefs are amazing, but i learned that i get sea sick. So glad i did it. Once in a lifetime experience. We loved our trip here and look forward to our next visit. Thank you for sharing your lovely home!! This was our families first trip to the Cayman Islands and we all had the most wonderful time. We narrowly escaped a blizzard that shut down O\'Hare Airport just after our flight took off. A lucky choice to take the first flight in the morning as flights after ours were cancelled. I have a hard time grasping that the temperature difference between here and home has been 100 fahrenheit. We thank our stars that we could see clearer here than ever before - that our family got a magical break from a cold Chicago winter. Thank you for sharing your home with us! It was just the right size for our family and the location was perfect, especially the quick walk to Ocean Frontiers. The kids enjoyed playing in the sand and splashing in the pool. The adults enjoyed lounging in the chair and relaxing with the beautiful view. Thanks again for the wonderful experience! We had the most wonderful time here at Lone Palm! We loved the location on East End-secluded, right next to Ocean Frontiers, amazing snorkeling right off our private beach, delicious fun restaurants. The house had everything we needed- we loved having the pool, kayaks, and snorkeling equipment. We spent our days kayaking, snorkeling, scuba diving, exploring the island, and going to the Cayman Spirits Co. Distillery. And we spent our nights at dinner at great restaurants (Tukka, Eagle Rays, Morgans at the Yacht Club, Kaibo), relaxing under the stars, playing cards , in the pool & watching a couple of movies. The highlights of the trip were a resort scuba dive and a snorkeling reef trip with Ocean Frontiers, a tour and tasting at Cayman Spirits, and eating at Tukkas restaurant- we ate dinner there twice! We will definitely be coming back! 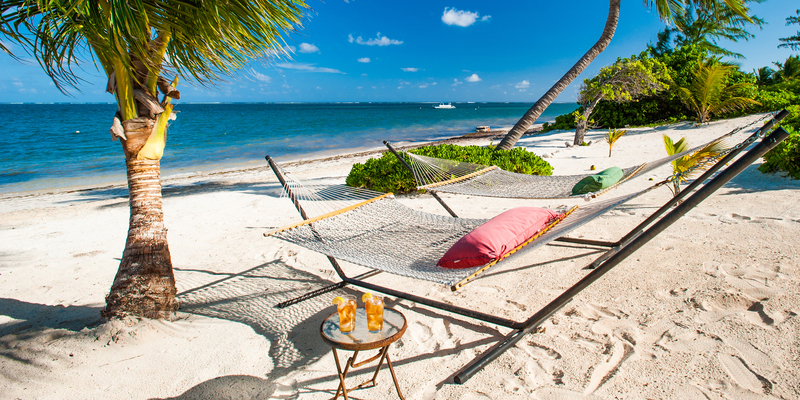 Lone Palm has set the bar for all of our future beach vacations! Our week of fun included a private charter with the amazing Captain George at Silver Thatch Charter, kayak trips out to the \"white pipes\" where there is good snorkeling, water boarding throughout the beach front and exploring/experiencing the various Cayman restaurants. Lone Palm had everything we needed to enjoy our honeymoon week. Super beautiful, quiet and relaxing. We loved the Lighthouse- never made it past the bar to get outside, but the people and food were amazing! The stars are so bright at night here. We laid on the beach and looked at them for hours. Had two nasty storms where the wind was super strong, but beautiful to watch. Thanks so much for offering such a great house with beautiful views. We will be back! We had a big party, 5 adults and 1 kid. On the Wednesday of our vacation, Brian asked Ciera to marry him. It was a storny evening and they sat under the hut looking over the ocean the rest of the night. That was for sure the highlight of our trip. Swimming with the stingrays was our second biggest highlight. It was truly an amazing trip. Even though it rained most of the trip it was still an amazing time. We hope to come back and visit again very soon! We ha the most amazing time here at Lone Palm! We had 8 people staying here, 2 families of 4. Although the island has a lot to offer, one of the most memorable days was one we spent simply staying at home. Hammock were hung, we slept under the stars, and all love the entire experience. We had all previously been to Grand Cayman, but stayed at a hotel. This time was very different staying in a house and was more incredibly more enjoyable. We absolutely LOVED DaFishShack, and found it to be our favorite meal through the entire trip! The food was incredible, there was a ocean view, and lots of friendly iguanas on the railing that come to say hello. Night kayaking was something incredible once we got over the dark water. All in all a fantastic vacation we all had the best time. We left a below zero windchill in Northwest Ohio to find amazing weather on the East Side! 🙂 We cannot thank you enough for sharing your lovely home! It is an amazingly beautiful location with everything we needed on hand. We are a family of five with three college students. We appreciated the fast WIFI, big screen TV for College Football Bowl Weekend, and the kayaks. Everyone had their own space with plenty to do. While on the island we booked a private charter with Crystal Sea for both fishing and snorkeling with the stingrays. We also took one day to scuba at Georgetown and visit the turtles, and stand on the edge of Hell. The boys visited the Wyndman beach for water-sports and took full advantage of the pool and hammocks. We visited Eagle Rays and Tukka more than once. We can\'t isolate one moment as our favorite as it was a memory making week for all of us. What a great way to start 2018! We loved the house. Upon first arriving, all 5 of us walked out to the beached and were just WOWED! The view was just perfect. The house was very comfortable and had everything one could want to enjoy a stay on the beach; from the kayaks and the stand up paddle board that where used on a daily basis to the charcoal and gas grill. The management staff where very attentive to an unforeseen issue, as it was immediately remedied. Already talking about returning for another stay. Loved every minute. Thank you for allowing us to rent your beautiful home. Lone Palm was the perfect setting for our family vacation!! We spent a week at Lone Palm over the New Year holiday! The private beach was amazing. The house had everything we needed. We spent time in the pool, swaying in the hammocks, enjoying the kayaks provided, snorkeling in the ocean, and just relaxing on the porch after sunset. The location is walking distance to nice restaurants and just a short bike ride to groceries and water sports. The house is beautifully maintained and provided all the creature comforts from home, like big screen TVs for watching college football and high speed WiFi for our children to stay connected! We loved it so much we have already booked Lone Palm for our next vacation! Glad you had a nice stay. Seaweed comes and goes with Mother Nature. We rake the beached periodically and try to clear before all arrivals. Hope you enjoyed Bombay Chopsticks and Eaglerays, a short walk away. And the BBQ at Big Tree BBQ. The snorkeling there is fantastic and diving with Ocean Frontiers is the best in the Caribbean! This was a great vacation home on the East End, especially if diving with Ocean Frontiers and snorkeling during the day. 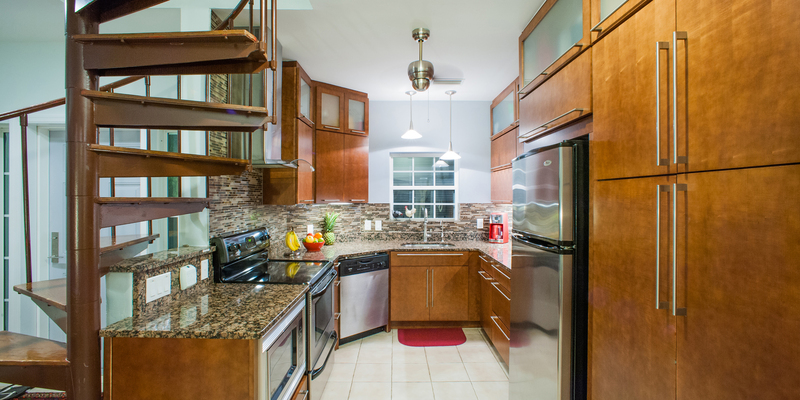 Everything was like the pictures and the house was very well maintained and perfect for a family / extended family. Best to have a rental car to explore other parts of the Island. We went to Rum Point one day and Seven Mile Beach one day. This part of the East End is best if you want to get away from the more tourist areas of the Island. Many good eating establishments close by...even though they don\'t look like much, the food is great (Eagle Rays and Tukka were very good). Would definitely stay here again. For the snorkeling, you have to be willing to kayak out to the dive spot about 300 yards off the beach, but still within the protected breakers, so it is a calm kayak trip. There is beautiful snorkeling at that location with stingrays, multitudes of fish (jack, puffer fish, etc. ), lobster (at night), octopus (also at night if you have very keen eyes), and much more. Keep in mind there is no fishing or spear fishing allowed on the Island except with a dive shop. Also, do not bring any dive gloves with you to Cayman as it carries a high penalty...they want to keep the corral as untouched as possible. Lone Palm is very nice, and a reasonable drive away from everything, and very easy. All of your needs in one place. As this is the East End, I recommend a rental car so that you can explore. Snorkeling requires using the kayaks (unless you want to swim out over the sea grass beds that are prevalent at GC, or traveling via dive shop or car to beaches and areas where there are coral heads near the shoreline Great dive shop, Ocean Frontiers, an easy walk away. I recommend them for both snorkeling and diving trips. Check out the Bio Bay tour via Kayak. Also, have to do Stingray City and go with Ocean Frontiers because they leave early before the crowds. Grand Cayman Villas was very organized, really nice, and everything was just as it was represented. No surprises, which is great. We came to Lone Palm for Thanksgiving week, and what a wonderful time we had! Walking in the door Lone Palm is immediately a welcoming home away from home. We spent our days walking next door to dive with Ocean Frontiers, heading up the road to kite board at Sweet Spot, and relaxing in between on the porch watching the palm treees and the beautiful ocean. We can\'t wait to come back! We had a wonderful stay at Lone Palm. We have been to Grand Cayman before but stayed in a large hotel on 7 mile beach. Waking up to a palm-dotted beach of our own was a true joy. 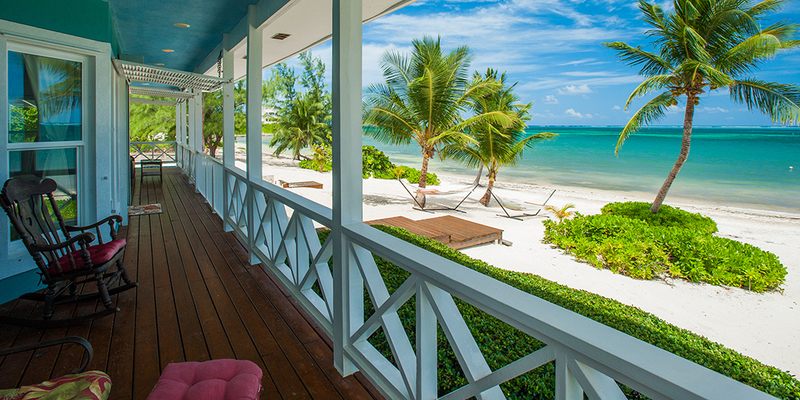 The porch was a perfect perch for reading books or just gazing at the sea. For quick meals we walked to EagleRays. Tukka restaurant was a big favorite too. Our elegant meal of the week was kaibo Upstairs! We also had a great snorkel trip with Ocean Frontiers and one afternoon we took a hobiecat trip with White Sand at the Wyndham hotel up the road. We also visited the Botanical Gardens and Pedro\'s St James to broaden our understanding of the island history. Brisk eastern winds the first half of the week gave way to calm conditions. We enjoyed the kayaks and nice snorkeling right off shore. Lone Palm is very functional, great coffee maker, nice indoor and outdoor showers, TV and internet with a strong signal. We tried to take good care of the home and it was obvious the owners take good care of their home as well. Awesome wee. Picture perfect weather! Complete relaxation. Our favorite activity was kayaking right off the beach. The house is amazing. We are fortunate to have found Lone Palm before booking on 7 Mile Beach. We finished off our week at the very fancy yet casual Kaibo Upstairs which offered great food and service. Stuart at the Mastic Trail was a great tour guide... Thank goodness for the great internet as one can never escape work and school! We will definitely be coming back to our \"Lone Palm\"!!! This was our second trip to Grand Cayman. Last time we stayed in West Bay at a home there. We were so happy we chose the East End this trip and will be back. We spent every morning ion the porch watching the sunrise, drinking our coffee and planning our day. Lone Palm is so comfortable. We loved preparing our meals in the wonderfully equipped kitchen, sitting on the private beach, shell hunting and just relaxing. Eaglerays food and staff rocked right up the street too. We went to Rum Point twice and discovered Starfish Point - loved seeing the starfish and wading out onto the sandbar. We shopped in Georgetown, went to Stingray City and snorkeled the Aquarium and Coral Gardens... This trip commemorated our daughter\'s birthday as well as our last full family trip before our oldest daughter heads for college. We hope to make it back soon and hope to stay at Lone Palm again! Beautiful home with plenty of room for everyone. Watching the sunrise in the mornings! Reading books in the hammock! Underwater adventures snorkeling! Kayaking! Kite-boarding lessons with Sweet Spot. Sunset vista at Rum Point. Gentle breeze off the Caribbean. Mesmerized with the aquamarine waters! Bird watching and Botanical Gardens. Tropical Flora. We arrived without a hitch. Pleasant weather. Quick lunch stop. Bombay Chopstix for dinner - amazing!!! We ventured out most days, to Georgetown, kite boarding, Stingray city charter (absolute must), Jet skis at Rum Point, snorkeling daily off our beach (best snorkeling of the week from all the places we stopped). Lone Palm was a joy to come back to and relax every afternoon. The open view living room made for conversation times and togetherness. 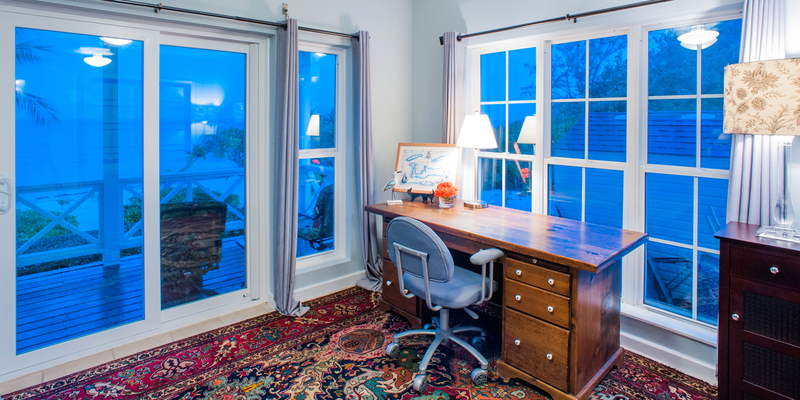 The master suite was fantastic!The outside porch is comfortable, great views and smartly designed for the structure. All appliances, large TV and internet were in excellent working condition. We would love to come back again! What an amazing experience we had on the Cayman Islands and staying at Lone Palm. Mornings started between 5:30-6 with coffee and sunrise on the back porch, breakfast at the dining table, afternoons of kayaking and snorkeling, naps, sun and adventures out and about. We dined out at Eaglerays, Bombay Chopstix and Tukka. We cooked in as well in the wonderfully appointed kitchen. Sunday brunch at the Lighthouse was amazing. Frozen drinks at Rum Point were had by all. To top off our stay, Lone Palm made us feel right at home. Beautiful, comfortable and peaceful and fully stocked. Although sad to leave, I don\'t think this trip could have been any better. Thank you for sharing your lovely home with us! Hope to return soon. We loved every minute of our trip away from hectic life back at home! Beautiful well taken care of home, with all amenities we could have expected. Very nice layout of the home gave everyone privacy and also allowed for gathering in the large, open living area. The loft was perfect for the children! We were blessed from the minute we stepped onto the island. Everyone friendly and helpful. We were invigorated by the number of churches on the island and refreshed to join in a local celebration of our religion. 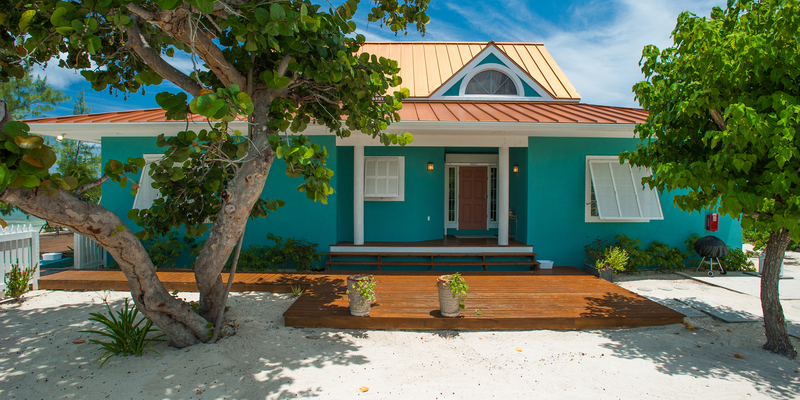 Thank you to the owners and rental company who helped us pick this wonderful home We highly recommend Lone Palm to anyone planning a Grand Cayman trip!!! We found Lone Palm to be welcoming, comfortable and a peaceful retreat. Private for our anniversary getaway. We stayed in Cayman 22 years ago celebrating our 10th anniversary on 7 mile beach. This location is much more delightful! 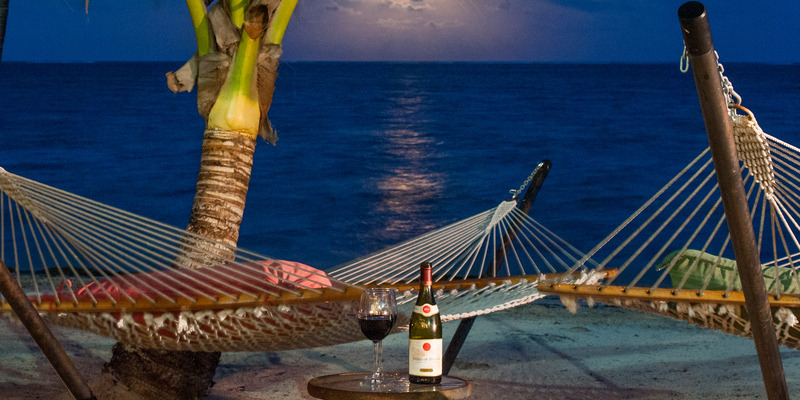 We began each day with coffee on the hammock watching the spectacular sunrises and finished each day on the hammock under the stars with a glass of wine. All so very breathtaking. We enjoyed the local fare at Tukka, EagleRays and Bombay Chopstix. Outside we snorkeled, kayaked, explored the beaches and parasailed... and snorkeled more! We went to 7 MB to remember great times and enjoyed a lovely sunset at the public beach. We hope to come back with our children and their families to show them the beauty of the island and its people. Thank you for a week long heavenly retreat! The house, with the large porch for shade and drinks, was perfect for my extended family and babies. House is fully equipped from BBQ to blender! Just an awesome vacation with the pool, beach, beautiful house and a bit of activity if needed next door or down the street at eagle rays, tukkas, or reef resort. Kayaks for exploring. Cool breezes kept us going strong- 7 mile gets so hot but not here! Rural and calm. Walked the street every morning to the historical sites was interesting. I didn\'t need to contact management because everything was perfect but it\'s awesome to know they would replied in 2 seconds if needed. We will be renting with this company again because they matched my particular needs perfectly! Thanks a million for making it the \"best vacation ever\". We stayed at Lone Palm for a delightful week! The house has all the amenities we could want. We cooked in a lot and the kitchen is great. It is a very organized and supplied kitchen. The place has fabulous views. We kayaked out and tied to the bouy for some great snorkeling. The pool was very welcome on warm afternoons. 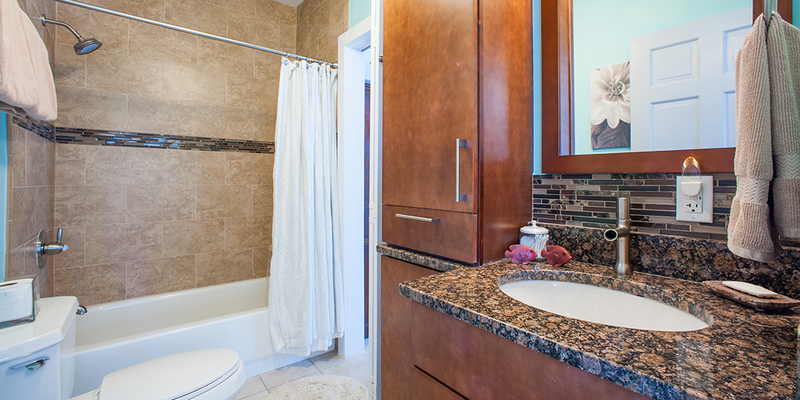 The bathrooms were supplied with Beach Bubbles products that we thought was a special touch. We all went to buy more. Lol. I don\'t want to leave! We spent a week at Lone Palm with our family for our summer vacation. The home was spectacular. Few homes are nicer than the pictures and description. Lone Palm is the rare exception. Plenty of room for our family of 6 (and infant). Beautiful beach with wonderful snorkeling and kayaking. Walk to Eaglerays restaurant/bar and Bombay Chopsticks and Big Tree BBQ. Short drive up to Tulla restaurant. Between the four, we did not need to go anywhere else! The market is only a short drive up the street as well. Wanted to try the Italian Kitchen, as we heard great things about the restaurant, but that will have to be our next trip. We ventured to Rum Point and Morritts, and those spots were fun. But we loved coming back to \"our\" place every time! Kids loved the Blow Holes and Crystal Caves excursions as well. We highly recommend the home and we will be back!!!! 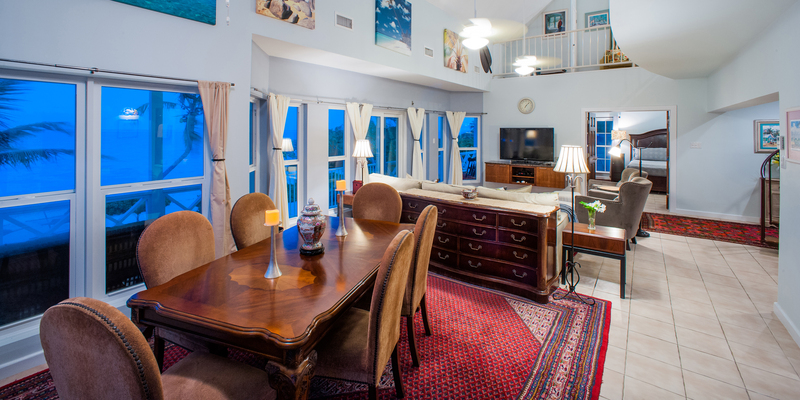 Lone Palm - cant say enough nice things about the home, location, rental company, beach, views. But the best part for us was the sunrise views each morning. Cup of coffee on the quiet porch welcoming the start of the new day. We tried SCUBA for the first time with Ocean Frontiers right down the street. So much fun. And the resort dive was within eyeshot of Lone Palm! Local restaurants were amazing. Local people were pleasant and helpful. The home itself was beautiful. 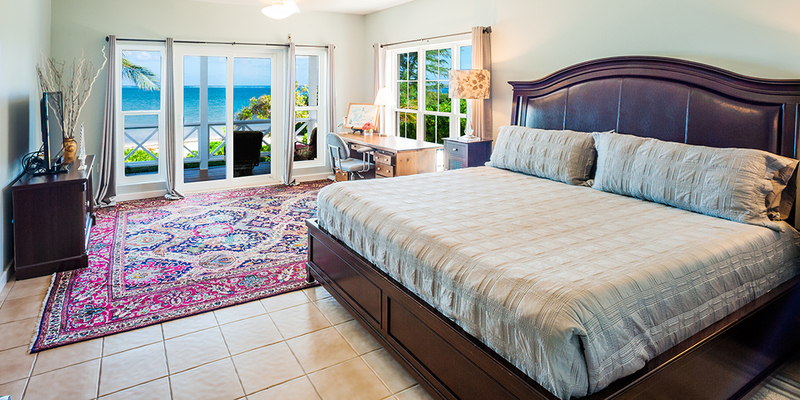 The two master bedrooms with ocean views were wonderful as we had 2 couples at the home. This was our second trip to Grand Cayman. We stayed at Rum Point the first time. Both spots were wonderful and each has its benefits. We would come again in a second. For now its back to the grind that we left behind... See you next time! We were celebrating my parents 40th wedding anniversary and had 6 adults and 1 child! It had perfect accommodations, and that back deck what can I say just breathless. Paradise, and the owners and staff were great to work with. Thank you for sharing your beautiful home with us. We came to Grand Cayman for a wedding. Lone Palm was a wonderful and perfect spot as the wedding party was staying next door atCayman Castle. We were able to spend priceless time with our friends and walk along the beach back to our peaceful home and Lone Palm is a Home Away from Home! It has everything and anything you could want or need. We will definitely be coming back here when we visit the Caymans! Thank you for everything!